Researchers at The University of Texas at Dallas are sweating the small stuff in their efforts to develop a wearable device that can monitor an individual's glucose level via perspiration on the skin. In a study recently published online in the journal Sensors and Actuators B: Chemical, Dr. Shalini Prasad, professor of bioengineering in the Erik Jonsson School of Engineering and Computer Science, and her co-authors demonstrated the capabilities of a biosensor they designed to reliably detect and quantify glucose in human sweat. The team has previously demonstrated that their technology can detect cortisol in perspiration. But for diabetics and those at risk for diabetes, self-monitoring of blood glucose, or blood sugar, is an important part of managing their conditions. "Fitness trackers that monitor heart rate and step count are very popular, but wearable, non-invasive biosensors would be extremely beneficial for managing diseases," said Prasad, the Cecil H. and Ida Green Professor in Systems Biology Science. Typical home-use blood glucose monitors require a user to obtain a small blood sample, usually through the prick of a finger and often several times a day. However, the UT Dallas textile-based sensor detects glucose in the small amount of ambient sweat on a person's skin. "In our sensor mechanism, we use the same chemistry and enzymatic reaction that are incorporated into blood glucose testing strips," Prasad said. "But in our design, we had to account for the low volume of ambient sweat that would be present in areas such as under a watch or wrist device, or under a patch that lies next to the skin." Prasad said that researchers who work with sweat often use a process called iontophoresis, which sends an electric current through the skin to generate enough perspiration for sensing experiments. However, because this method can lead to rashes and burns on the skin, the team sought an alternative that would work with small amounts of sweat. Their design works with volumes of sweat less than a microliter, which is the approximate amount of liquid that would fit in a cube the size of a salt crystal. The technology also provides a real-time response in the form of a digital readout. Prasad and bioengineering doctoral student Rujuta Munje, lead author of the journal article, incorporated an off-the-shelf polymer-based textile material in their glucose sensor and used UT Dallas clean-room facilities to construct the electronic elements. 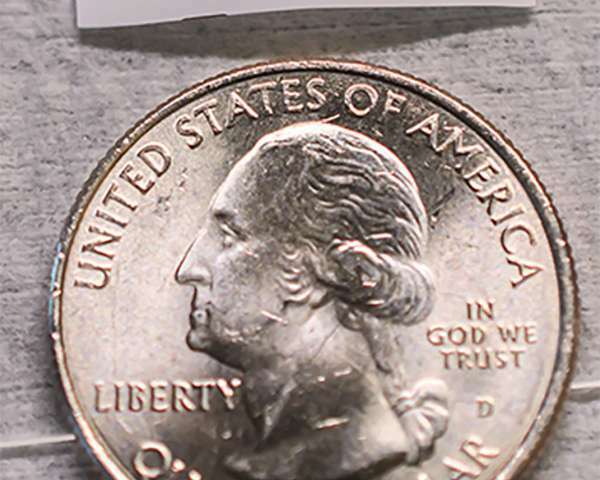 The prototype is a small, flexible, rod-shaped device about an inch long. "We used known properties of textiles and weaves in our design," Prasad said. "What was innovative was the way we incorporated and positioned the electrodes onto this textile in such a way that allows a very small volume of sweat to spread effectively through the surface." Typical blood glucose testing strips also contain a molecule that ultimately amplifies the signal from the chemical reactions on the strip enough to register electronically on a monitoring device. But if used in a device that is worn next to the skin, those molecules can be irritating, Prasad said, which presented another challenge. To ensure that such a tiny amount of sweat would generate a strong enough signal, Prasad and Munje modified the surface topography of the textile material. "Our modifications allow this material to entrap glucose oxidase molecules, which effectively amplifies the signal," Prasad said. "We did it this way because we are thinking about possible commercialization—to make these, we need a fabrication process that is not complex." Prasad and Munje also were able to account for the fact that the chemistry of a person's sweat changes throughout the day. "Glucose is a tricky molecule to monitor because other factors can confound a signal," Prasad said. "For example, the pH, or acidity, of your sweat can vary greatly depending on the circumstances." She noted that when individuals exercise or are under stress, the level of other compounds in their sweat, such as cortisol and lactic acid, change as well, and these can interfere with glucose detection. Prasad and Munje tested their prototype using samples of human sweat from donors. While a consumer product based on the technology is still a few years away, the concept was developed with commercialization and scaled-up production in mind. 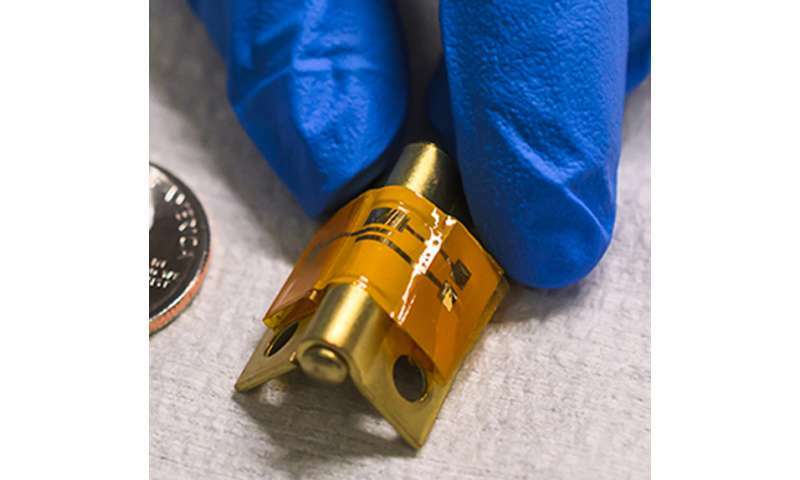 "At this point, we are thinking of this sensor as something you use for a day and toss out, and we believe it could easily be incorporated into existing consumer electronics platforms," Prasad said. "We're very excited about the potential for licensing this technology." The research was supported by the Cecil H. and Ida Green endowed fellowship at UT Dallas. Researchers at UT Dallas and elsewhere have investigated whether glucose found in other bodily fluids—such as urine and tears—might be used to track glucose levels, further eliminating the need for invasive blood draws. Google, for example, is investigating a smart contact lens designed to measure glucose levels in tears. Blood-glucose monitoring devices have revolutionized the management of diabetes by making it easy for ordinary individuals to test their glucose levels at home. But there are no similar consumer devices for cardiovascular disease, specifically for the quick and easy diagnosis of a heart attack. "The onset of heart attack symptoms is usually gradual, over several minutes," said Dr. Shalini Prasad, professor of bioengineering at UT Dallas. "But if you think you might be having a heart attack, every second counts to get a diagnosis and treatment." Prasad and biomedical engineering doctoral student Nandhinee Radha Shanmugam have developed a flexible, mechanically stable, disposable sensor for monitoring proteins circulating in the blood that are released from damaged heart muscle cells at the onset of a heart attack. Troponins can be found in the blood within about four hours after a heart attack, and for up to several days. Low levels of troponin in capillary blood, such as that found in fingertips, correlates to higher levels in arterial blood, Prasad said. For this reason, the researchers focused on detecting ultralow concentrations of troponins with high accuracy in small volumes of blood drawn from a finger prick. The key to the sensor's performance is the way Prasad's group incorporated nanostructures into the device's zinc oxide electrodes. The nanostructures enhance the binding of the troponins to the electrode's surface, making the device ultrasensitive. "Our technique for growing these nanostructures on a variety of substrates opens up an entirely new and exciting research direction in the field of electrochemical biosensing for other biomolecules, like glucose, cholesterol and uric acid," Prasad said. The researchers recently described the technology in the online open-access journal Scientific Reports, part of Nature Publishing Group.